When I heard “You’re all under arrest,” my heart jumped in my throat. I flashed on who-will-take-care-of-the-dog-what-about-babysitting-I’d-promised-I’d-do-tomorrow- and what-about-the-cat-and-what-about-all-the-work-due-for-my-class-this-week- what-if-I-can’t-get-to-my-class. I’ve never really been in jail before. It was an “International Respect for Chickens Day” protest. We were in the San Francisco Ferry Building which is a sort of foodie plaza where you can spend all sorts of money on “artisan” cheese, olive oil, nuts, fruit, pricey bread and “humanely-raised” meat. In fact, it was in front of one of these “humanely raised and cruelly-killed” meat places where two animal rights groups, United Poultry Concerns (UPC) and Direct Action Everywhere (DXE), had joined to cause a disruption. “HUMANELY RAISED,” shouted long-time activist Hope Bohanec of UPC. “KILLS CHICKENS” we shouted back. Back to the protest: So we were lined up in front of the meat counter and here was this guy dressed in a uniform saying we were all under arrest. But I looked around and saw nobody really budging and realized that the guy talking about arresting everyone was actually a security guard – not a police officer. And even if he had been a police officer we would have to be given a reasonable amount of time to leave. The guard sort of laughed and shook his head when he heard we were protesting the cruel treatment of chickens. Conventional belief is that chickens are stupid, if not ridiculous. 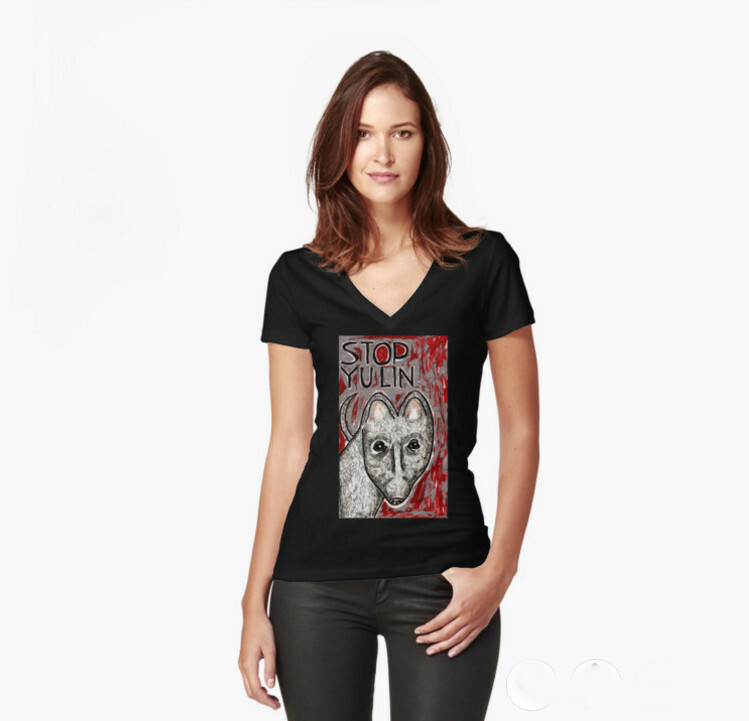 The reality is chickens are sentient beings who feel pain, fear and, at times, contentment. Scientists have discovered that chickens recognize and remember human faces, they communicate with other chickens, they learn from each other and they teach their young, new behaviors. And when they’re happy and safe, chickens purr. Yet chickens are, according to Bruce Friedrich of Farm Sanctuary, the most abused of all farm animals. Of the 9.1 billion land animals killed for food in the U.S. during 2013, over 8.5 billion were chickens, according to the USDA. And being raised “free range” and/or “humanely’’ means little or nothing for most. “Humane,” “Sustainable,” “Cage Free” are basically advertising slogans designed to increase sales and prices while reassuring troubled consciences. Cage free means, in most cases, thousands of birds stuffed into a darkened filthy shed. Cage free also means that male layer chicks which are of little use to industry are ground up alive or suffocated in garbage bags shortly after they’re born. Backyard chicken farmers please know, this is what happens to the male chicks you don’t buy. “Free range” broiler chickens are also stuffed by the thousands into these same types of sheds. Those chickens are so deformed and maimed by selective breeding to have huge breasts or “drumsticks,” they can barely move. Experiments have shown that broiler chickens are in nearly constant pain. It’s a horrible, horrible scene, which is why I just kept standing there with everybody else holding my sign in front of this meat counter listening to the DXE speakers. One of the butchers wearing a bloody apron came out from behind the counter and got in front of me and said, “Don’t you have something better to do?” which I thought was a very interesting question given the circumstances. Trying to drown out the protesters. 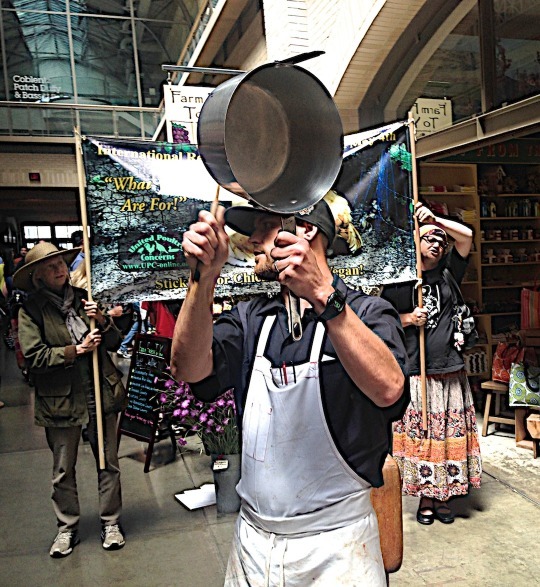 As the DXE speakers continued (LOUDLY,) another butcher came out of the back with a spoon and a big pan which he started to beat ferociously to drown out the speaker. It was loud enough to hurt my ears and sounded like one of those “Come ’n’ get it” triangles from cowboy movies. 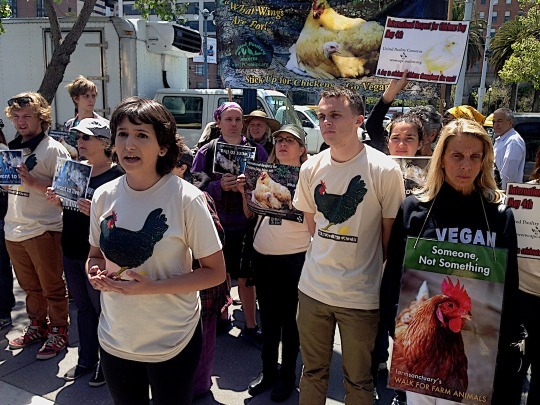 What they saw was us with our signs and our huge banner decrying chicken slaughter, an upset dude in an apron banging on a pot and security guards fluttering around trying to stop the photography. Eventually though they had to give up on trying to stop the photos, because even the foodie/tourists were filming. Once the short speeches and the chanting were over, we left. The whole thing must have been 10 minutes, max. Next location: A “humanely-raised” restaurant with tables on the sidewalk in front of the Ferry Building. Protesters attempt to wake up diners to the cruelty of their meals. The people sitting at the tables just stared as DXE members spoke to the crowd about the horrors of the so-called humane meat industry. I saw one man eating a hamburger trying to sort of duck down when he took a bite. His companion looked miserable. I kind of felt sorry for them. 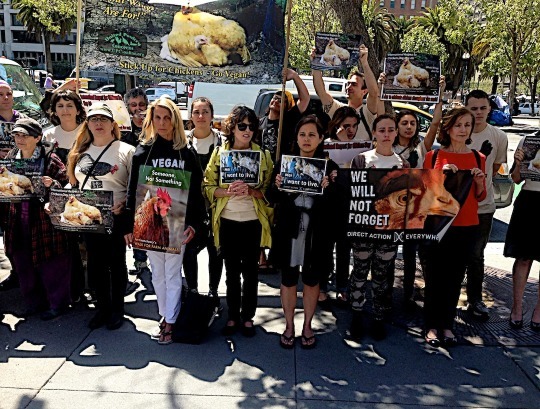 I’m sure lunch hadn’t been cheap and after all, these were folks who cared enough about farm animals to try and do the right thing – buy “humanely raised.” Maybe some lights were going off inside their brains. That’s what I hoped. Security came back, this time with a bright blue plastic tarp which they held up as barricade between us and about four tables in the restaurant. The “barricade,” of course, did nothing to stop the sound and it was too small to block the views of most of the people in the restaurant. It was silly but I thought there is a serious side to animal rights protesting. I’d read Will Potter’s book, “Green is the New Red,” about animal rights activists who had done nothing more than operate a website and had been sentenced to federal prison for lengthy terms. 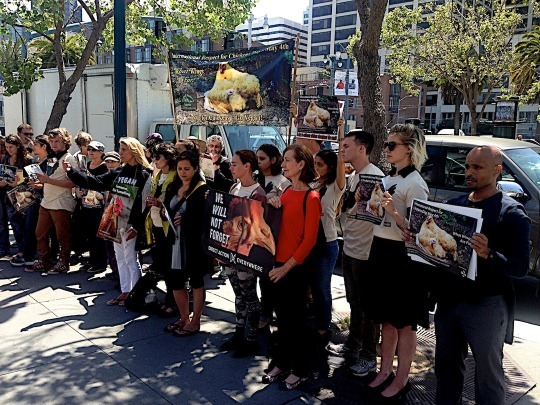 Protesters stand opposite outdoor restaurant where ‘humane meat’ is served. DXE founder and attorney Wayne Hsiung explained after the protest ended that out of the many, many animal rights activists only 10 have ended up in prison under the 2006 Animal Enterprise Terrorism Act, and that animal rights and environmental activists no longer get top priority from the FBI. Hsiung said, compare what’s happened to animal rights activists to the tens of thousands of innocent Muslims who have been imprisoned in the U.S. under the Homeland Security Act or the millions of innocent African-Americans who have also been imprisoned in the United States or have been brutally killed by police simply because of the color of their skin. There’s a lot of work to do in Amerika.